Sunset at South Point, South Caicos. 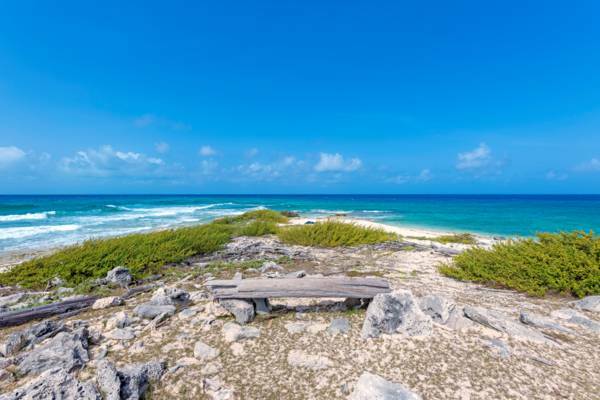 The low cliffs and course sand beach of South Point is the best spot on Salt Cay for shell beachcombing. The coastal landscapes here are also quite beautiful. South Point is a great spot for exploring. South Point, as the name suggests, is the extreme southern tip of Salt Cay. This very scenic beach and coastal area features some rather nice patches of sand, as well as rocky limestone ironshore coastline. An interesting aspect to the area is the contrast between the east side of the point (South Bay), which is usually constantly buffeted by the eastern trade winds and waves, and the west side of the point, which is in the lee of the island and consequently calm and sheltered. 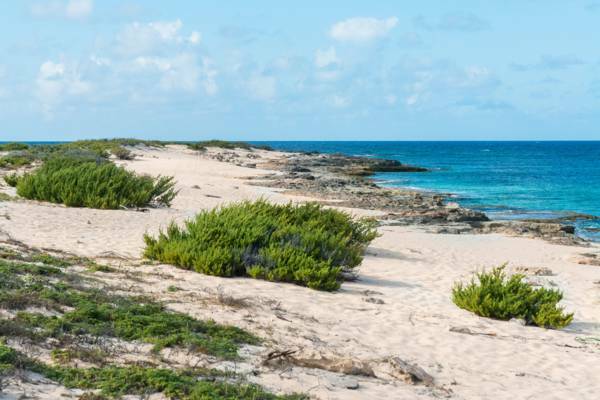 South Point is probably the best beach on Salt Cay small seashell beachcombing. As the coast continues to the northeast, the flotsam beachcombing finds of fishing floats, interesting bottles, and driftwood increases. In calm weather, South Point offers decent snorkelling and swimming. The small and beautiful patches of beach interspersed between the low cliffs on the western side of the point offers tranquil swimming conditions. There can be a current offshore from South Point, so take caution when swimming and snorkelling off the extreme point. The nearby vale of South Wells is also nearby, and attracts a quantity of Salt Cay’s semi-feral donkeys and cattle. Salt Cay is very small island with extremely limited natural sources of fresh water. The water from shallow livestock wells here have quite high levels of salinity, which the donkeys can barely survive on. The ocean off of South Point, Salt Cay. To get to South Point, follow the main straight road (Victoria Street) along Town Salina from Deane's Dock south to its conclusion (about 2.2 miles or 3.5km). You will pass South District, the Salt Cay power station, and the island's small dump. The track is a bit rough in this area, yet it does improve closer to South Point. Small off-road golf carts are the common mode of transport on Salt Cay, and the tracks to South Point are adequate for the vehicles, if not a little rough in places. A very scenic drive is to return on the eastern route from South Point, which leads past South Wells, South Bay, Pilchard Hole Salina, South Creek, and finally, back to South District.